Final result: - Cardboard box completely closed with hot-melt glue. 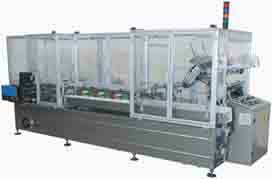 Packing speed: - Max100-120 box/min depending on product and people feeding. - Left hand (the product flows from right to left seen from the front of the machine). - Heavy duty stainless steel welded frame. Machine designed for 3 shifts operation. - Continuous motion with all movements mechanical driven not with pneumatic actuators. - Integrated in the machine with self driving. Sensor for stopping the conveyor if overloaded. - Blank extraction by suction rotating cups. Low level feeding height with low magazine inclination with automatic feeding belt. - Manual loading with wide space to allow two people operation. - Heavy-duty conveyor with four chain, ¾" roller chain. (no 2 used for pushing and no.2 for box size adjustment), steel lugs laser cut from 4 mm blade and machined for good boxes squaring. - Set-up hand-wheel controls with readout. 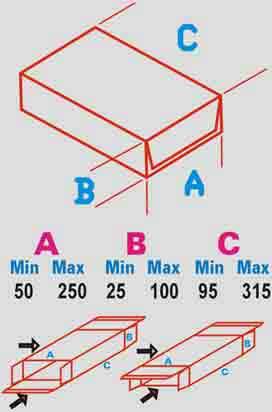 - Unit with hot melt glue for carton closing. Single stripe in two side flaps. PREO unit. 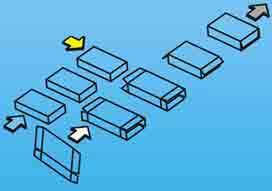 - All flaps are closed by fingers/disks mechanical driven. - Flap compression after gluing by two belts and used also for horizontal discharge internal driven. - Driving made with timing belts HTD type. Overload clutch for safety operation. Hand-wheel drive for manual setting. - Machine without lubrication necessity of daily lubrication. - All adjustments set with hand wheels and mechanical digital readout. Quick release handles. - Electric oil less vacuum pump. - Interlocked guards all around machine. - Internal line shaft drives. All drives located outboard of product and carton conveyor. HC120 horizontal continuous - cartoner process flow.